Before I get into this post, I just wanted to let you guys know that I got into the study abroad program I applied for in San Sebastián, Spain! I found out on Saturday, so now I'm just waiting to hear back from the London program, and depending on what they say, I'll choose between the two! At least now I know for sure that I'll be studying abroad this summer. I am so, so, so excited!! Both locations would be a blast, so I don't think I can go wrong with either program. Hopefully I hear back from the London program soon, though, so I can decided and start getting ready for the program I choose, because they are both coming up in about 5 months! That really isn't long, and I like to prepare early, so I'm itching to make a decision. Now moving on to the post at hand: you may have heard the term "lampshading" here and there, and you're probably thinking uh, why would I want to look like a lamp? When I first heard of this, I was super confused as to what it actually meant, so I looked around, and I am loving this trend! It just basically refers to wearing an oversized turtleneck sweater, with either tights and boots, or knee high boots. 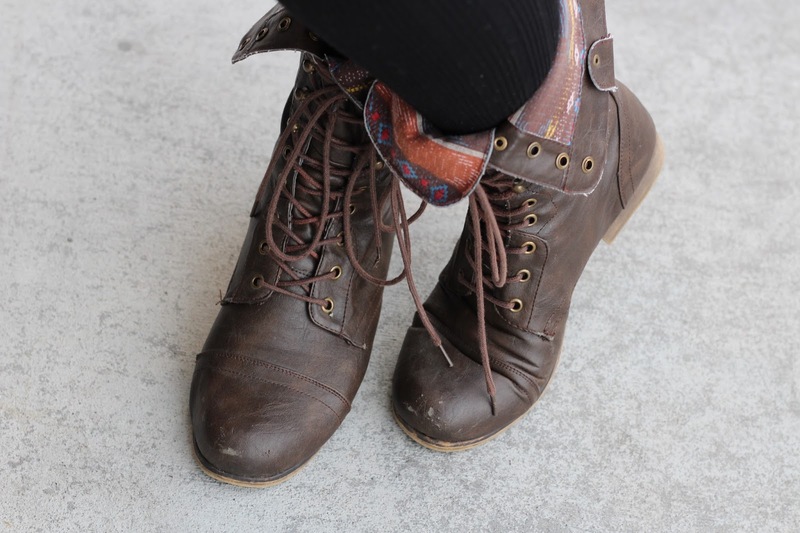 I always wear mine with sweater tights for warmth, but I think they also look so cute with knee high boots! I have really been wanting to get a pair of knee high boots because they can dress up any outfit, and they are just really cute in general. When it comes to sweaters, I usually always go for more neutral colored ones, so I really wanted to try something new with this electric blue colored one! It's great to brighten up your wardrobe in the winter, and it makes my hair pop, which is really nice. I got this sweater from H&M. 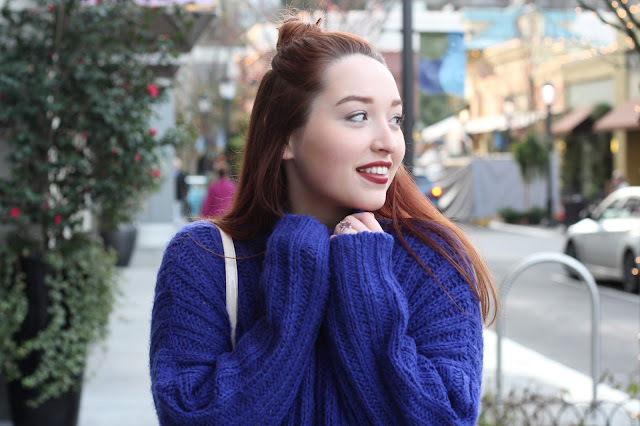 I usually wear this sweater with my sweater tights from Nordstrom, but it can also be worn with leggings! 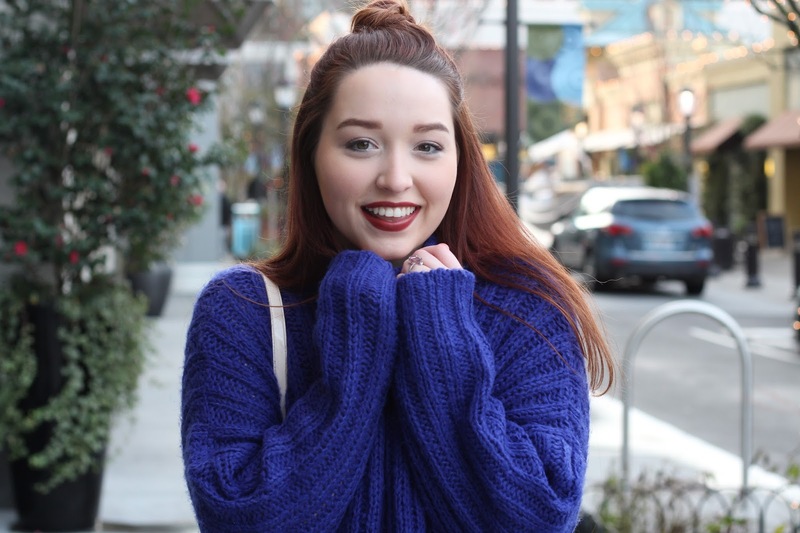 Whichever you prefer will be really cute, because you can't go wrong with these sweaters. 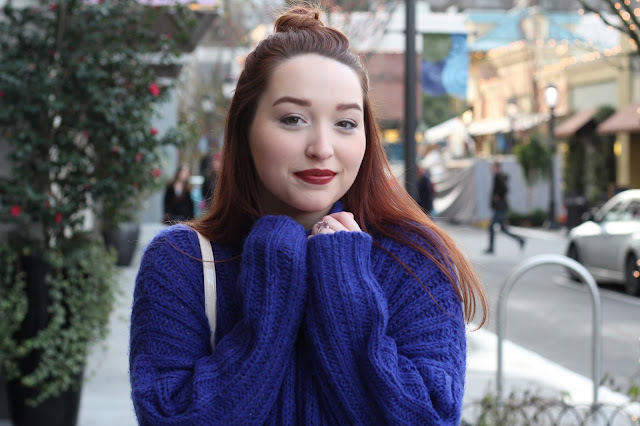 I like to wear simple statement jewelry with my sweater, because I want the main focus to be the turtleneck aspect, and the color. 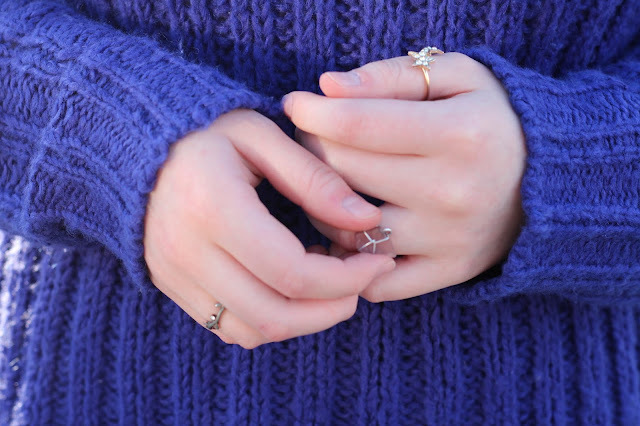 Here, I have a couple of my favorite rings: my moon and star one from Tilly's, my vine ring I always wear, and also a geode ring one of my best friends got me. I like the eclectic collection of all of them when they are put together! Keeping my hair in a half bun also keeps it out of my face, which is really nice, and adds a little complexity to the look. Turtleneck sweaters also look really nice with your hair pulled slicked back into a ponytail, for a more chic look! I actually did that today with this outfit, and I love how it looks. You can also always go for an effortless down 'do! Here, I'm just wearing my classic baby pink bag from Ted Baker, since really anything goes with this sweater. It gives it a bit more of a girly look, but I think pairing this with a dark bag could make it look super cool as well. I was wearing this out during the day, so I tend to go for lighter colored bags when I am running errands. This one also happens to basically contain my life, so it's easier to grab when I know I'll need random little keepsakes from my purse. I like to wear my classic combat boots from Steve Madden with this outfit, because it gives the look a bit more of a grunge style to it, but if you pair different shoes with a turtleneck, it creates a whole different feel to the outfit! Thigh high boots make it look super chic, booties can add a really cute night-out look, and I love my combat boots when I wear this during the day. 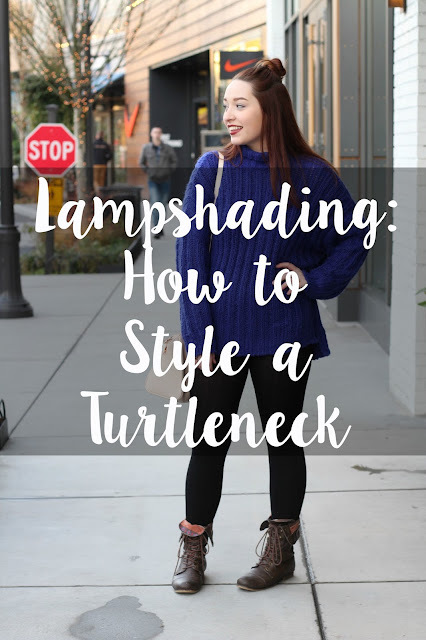 Those are my tips on styling an oversized turtleneck sweater, and how to achieve the lampshade trend that everyone is talking about! It's a bit of a strange urban trend - I've seen it a lot in downtown Seattle - but I think it is so cute, and works for everyone. It seriously feels like you're wearing a blanket all day, and is perfect for a cold winter day when you just want to cuddle in a huge sweater, but still look cute! I have been loving them as well! First of all, congrats on getting into the study abroad program!! Thats so so exciting! I hope you hear back from London soon! As for the outfit, Love it!! I can't even remember the last time I wore a turtleneck but i'm loving this whole look! The blue really does make your hair pop! Your hair looks amazing with the colour of the turtleneck! I love you outfit, its so cool and casual especially with the turtleneck sweater. I love the chunky turtleneck sweater on you! And adore that you wore it with a top knot - so chic!